Recalling "The Last Wave" by Peter Weir (1977): a warning about Cumbre Vieja now? On Oct. 15, on the Movies blog, in reviewing “Take Shelter”, I made a comparison to Peter Weir’s 1977 Australian film (United Artists), “The Last Wave”. The film is prescient as to today’s debate on climate change (although when it was made, scientists actually feared global cooling). There are sudden and protracted torrential downpours in various parts of arid Australia (in areas that have been ravaged by wildfires in the past few years). The film gets into the issue of wrongs done to the aborigines, and a possible curse. A brawl in a bar and the death of one aborigine accelerates the plot, as does the background of a lawyer (Richard Chamberlain) who defends them. The idea of “DreamTime”, maybe like “Inception” in the recent WB 2010 film from Christopher Nolan, comes into play. But eventually there will be an apocalypse: a gigantic tsunami, maybe hundreds of feet high, a Last Wave. This could be caused by a comet or asteroid hitting the ocean. Perhaps it could be caused by an underwater earthquake, although the tsunami in the movie (at the very end) is much larger than that in 2004 off Indonesia or this year off Japan. It could happen on the US East Coast because of the Cumbre Vieja volcano in the Canary Islands; as far as I know, there has been no effort to prepare for it. See this link. Last night, Bill Weir and Richard Besser introduced Dr. Nathan Wolfe on Nightline, in Cameroon, where he looks at the behavior and animal exposure of indigenous peoples whose close contact with jungle animals could lead to the next animal-human virus jump, leading to the next flu or possibly hemorrhagic fever pandemic. The people in this areas hunt and eat monkeys and porcupines. A woman was shown skinning (shaving or dequilling) a porcupine before cooking it. Wolfe has a new book, “The Viral Storm: The Dawn of a New Pandemic Age”, from Times Books. There is a question as to whether money should be spent on diseases that “haven’t spread”. Yet, out of nowhere, a new virus could threaten civilization as we know it. On Tuesday Oct. 11, PBS Frontline aired the one-hour report “The Anthrax Files” in conjunction with McClathcy Pro Publica, link (website url) here. The report plays devil’s advocate with the FBI’s evidence against Bruce Ivins and the DNA evidence in a particular flask, and says that a report from the National Academy of Sciences weakens the FBI’s claim. This aspect of the reporting did not occur in the CNN version (Oct. 2). Here is the link for the Committee on Science, Technology and Law. Also, the PBS version presents non-alarming reasons why Ivins could have been working alone so many hours at night, although it's interesting to me that some of the heaviest hours were logged just before 9/11. The PBS report also spent more space on an earlier “person of interest”, including the draining of a pond only to find a turtle trap. US Assistant Attorney Rachel Lieber still insists that the confluence of all the evidence would have justified prosecution and conviction of Ivins. But if the case against Ivins is not all that air-tight in retrospect, the real killer could still be out there. Check out the NY Times editorial "Who mailed the anthrax letters", here. This does not seem to be quite ready to be called a "case closed". 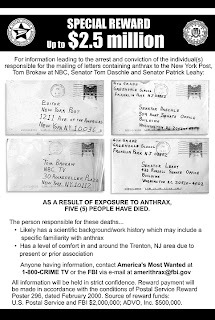 On Sunday night, October 2, 2011, CNN examined the 2001 anthrax incident ("Amerithrax" according to Wikipedia), with particular attention to the investigation of Dr. Bruce Ivins at Ft. Detrick, MD, with Joe Johns reporting. 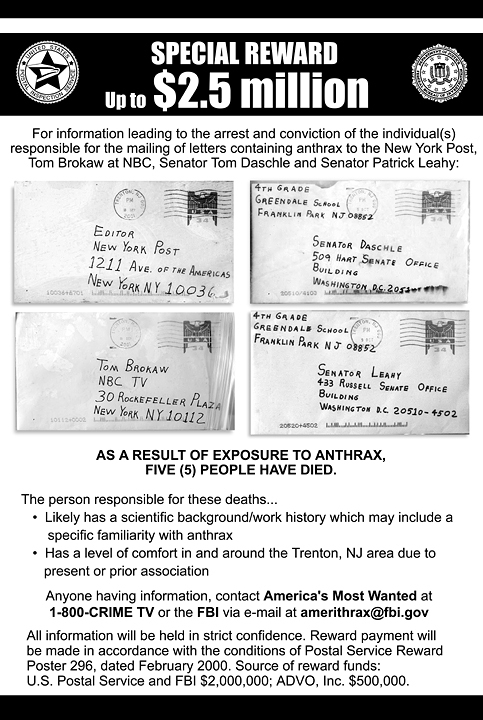 The name of the documentary film is “Death by Mail: The Anthrax Letters”. By now the story may be familiar. I remember the fright of the first reports from Florida (the tabloid company) a couple weeks after 9/11. One of the oddest facts about the Ivins case is that he often worked alone at night without a reasonable explanation. One claim by plaintiffs suing the government is that the Army should have required two people be in the lab at all time and should have done more psychological profiling. Ivins showed signs of serious instability and compulsive behavior, particularly over the loss of attention from a female friend in graduate school. Eventually, he would admit to stealing her lab notebook in grad school, vandalizing her property, and forging her name on a bizarre newspaper letter to the editor supporting hazing as necessary to “weed people out”. A young female federal prosecutor says the FBI was very close to charging him, before he took his own life. But Ivins’s attorney says there is no DNA evidence linking him to the attacks. I recall that there were two other arrests in the Trenton NJ area at the end of 2001, and the media never followed up on these. Wikipedia attribution link for FBI reward poster.